Star Wars is undeniably one of the greatest franchises of all time and the original “Star Wars” trilogy is simply a classic gem from my youth. However, I didn’t even know about Star Wars until I was about 7 years old (in 1997) when the special edition trilogy was being released in theaters. Seeing those movies on the big screen was the perfect way to be introduced to them for the first time. But surprisingly, I had actually been introduced to the universe of Star Wars before I even knew what Star Wars was. That’s right, before I saw any of the original trilogy, I saw the 1984, live action, made for TV movie titled “Cavern of Courage: An Ewok Adventure”. 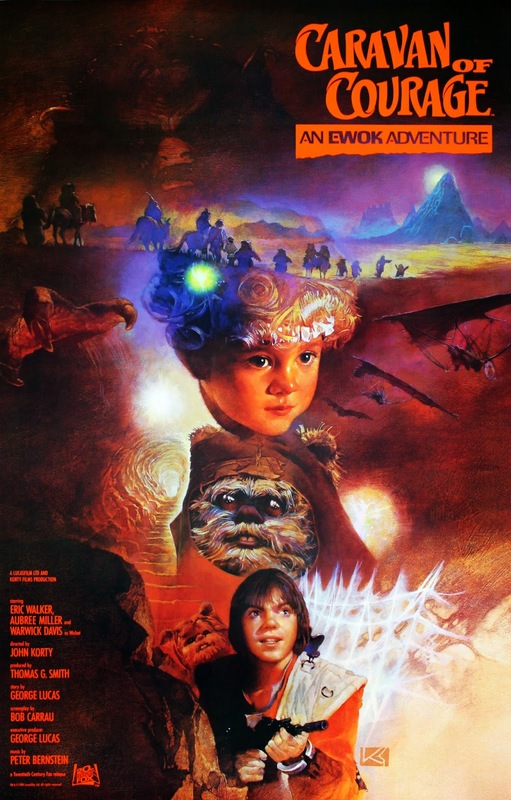 At the time, I was introduced to several cult favorite fantasy films including “The Never Ending Story”, “Labyrinth” and “The Dark Crystal”, and this film didn’t feel all that different, little did I realize that it was actually part of a series that I’d come to love for years. 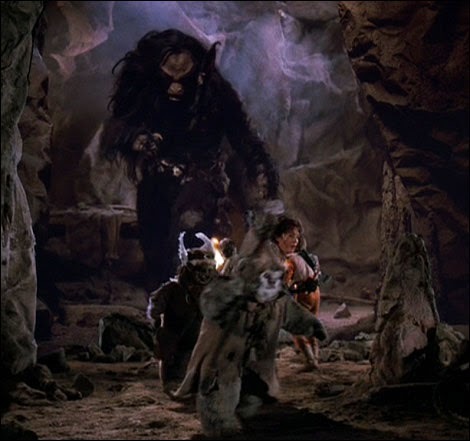 “Cavern of Courage: An Ewok Adventure” premiered on ABC back in 1984, a full year after “Return of the Jedi”, and as the title would suggest, it stars the furry Ewok characters that were previously featured in that film. Lucas had allowed his Star Wars Universe to be produced for TV 6 years earlier with “The Star Wars Holiday Special” which was a huge embarrassment to him. So Lucas assumed full control over the content and production in “The Ewok Adventure” to ensure that it had good quality. 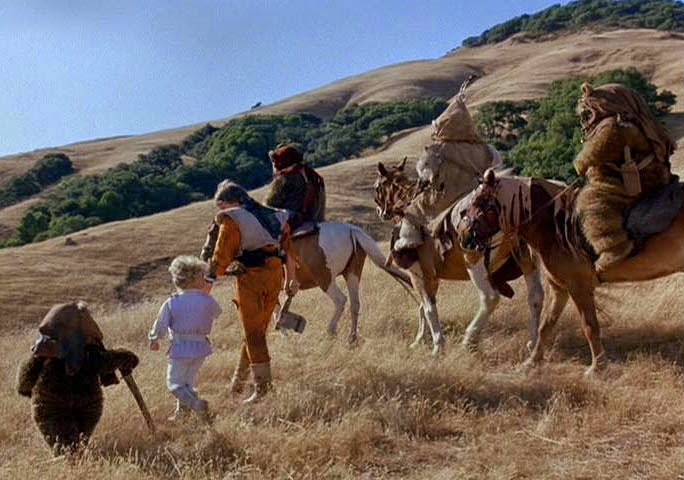 The result is a film that’s far more like a fantasy adventure and aimed more to little kids than any of the theatrical Star Wars movies, and while I adored it as a child, let’s take a look back and see how much of it holds up today. The film is supposedly set between the events of the animated “Star Wars Ewoks” TV series and “Return of the Jedi”, however, there really isn’t much continuity between the two. 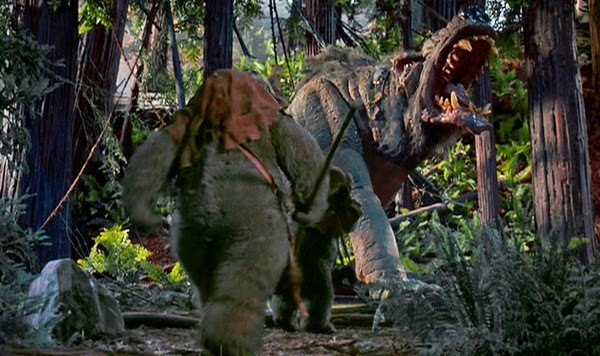 Here’s the set-up, after a family crashes their ship on the forest moon of Endor, two siblings named Cyndal and Mace find themselves separated from their parents, who’ve been captured by a giant monster called the Gorax. The two kids are soon approached by the fun loving Ewoks, who take pity on the two and welcome them into their tribe. 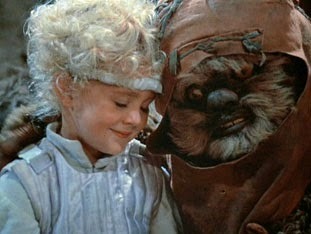 After Cyndal and Mace befriend the Ewoks, they set out on a quest across the planet to rescue their missing parents. Along the way they encounter savage beasts, and other magical obstacles. It’s more or less what you’d expect from a fantasy adventure, just with a an unfortunate lack of real epic excitement. 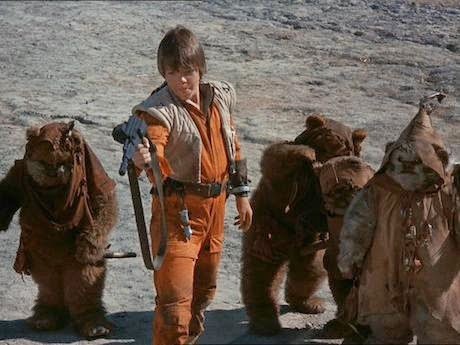 It’s interesting that of all the different Star Wars characters that could have gotten a standalone movie, they’d make one staring the Ewoks, who most fans were really annoyed with back in “Return of the Jedi”. 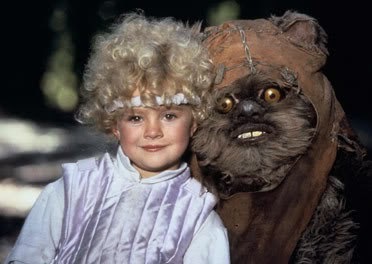 Personally, I kind of liked the Ewoks, mostly due to my nostalgia for this film. The most recognizable of them obviously is Wicket (that’s the Ewok who helped Princess Leia) played once again by Warwick Davis. Technically, he’s the closest we get to having an iconic Star Wars character in the film. Surprisingly, Wicket is actually given less attention than some of the other Ewoks. 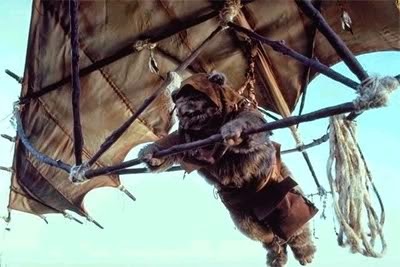 If your one of the few people who liked the Ewok characters, than the film does provide a good incite on their culture, their weapons, magic talismans and life style, which is kind of neat. There’s actually a nice variety of different Ewok characters, most of which were featured in the animated “Star Wars Ewoks” TV series. There’s a warrior Ewok that wealds an ax and there’s actually an Ewok wizard with a magic scepter. The main human characters unfortunately are nothing special, and become really annoying, mostly because of the performances. The parents act like stage actors, and half the time they don’t even look invested in what they’re doing. The child actress playing Cyndal is kind of generic, but she really isn’t horrible by child actor standards. 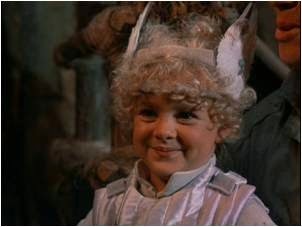 On the other hand, the actor playing her older brother Mace is really obnoxious. He’s admittedly tying to emote, and kudos to him for keeping it together while surrounded by actors dressed in teddy bear costumes, but he just goes way too over the top on his delivery and his voice isn’t the most pleasing to listen to. Now there are a few little nods to Star Wars that are welcome little additions. 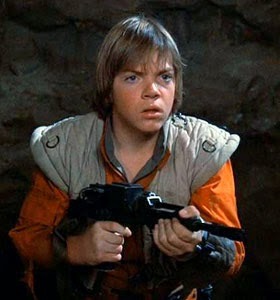 Maces gun for example makes the same sound effect the storm trooper weapons made, and his outfit is an obvious nod to Luke Skywalker's X-Wing uniform. The movie itself moves at a slow and simple pace which can be really boring if you’re not in the right mind set. The film was shot on location in the California Red Woods, which dose provide some nice scenery, and I do like that we see more of the Endor planet, including a barren desert, caves and a mountain range, as opposed to just the woods. As for the actual adventure that our hero’s impark on, well, don’t expect “Lord of the Rings”. To be fair, some of the locations and obstacles they encounter are pretty inventive. There’s a lake that traps people under water, they have to cross a giant spider’s web, and a lot of the creatures they encounter are a lot of fun, in that cheap B movie fashion. We have saber-tooth wolves, an Eel living in a tree, a little flying Pixie creature that reminds me of Tinkerbell, and some of these creature effects are actually quite impressive by TV standards. But there’s plenty of silly monsters too, including these giant spiders that look unbelievably fake. These spiders actually have cool alien designs but their so cheap looking, and they move like marionettes. 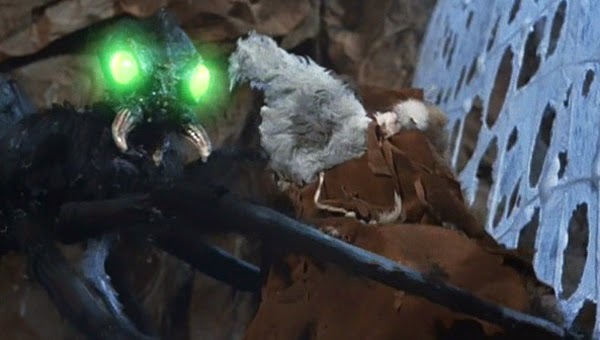 The highlight of the whole movie by far is the climax, when our hero’s battle the giant cave creature called the Gorax, who’s holding the parents captive. This monster is awesome, in fact he’s easily one of the coolest creatures to come from the Star Wars franchise. I love the design, the creature makeup is fantastic, and it effectively looks and feels like a giant monster. 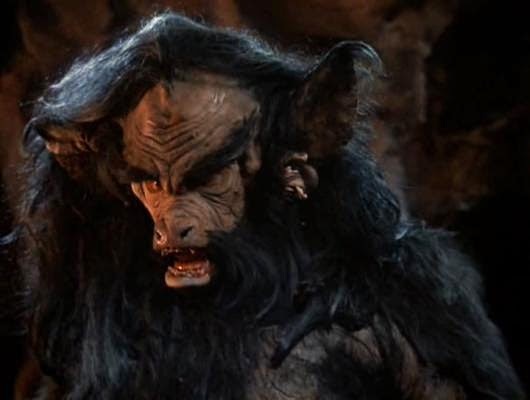 While most of the monsters in this film look obviously fake, this Gorax still holds up very well, and it’s a legitimate thrill whenever it’s on screen. So that’s “Cavern of Courage: An Ewok Adventure”, and while I honestly have a soft, little nostalgic spot for it, I can’t really call it a great movie either. A lot of it is dated, with its silly overtone, standard story, mediocre impressive effects and less then stealer acting. It’s not a film that that I’d highly recommend, but it’s still a perfectly harmless family film all the same. I think kids can still enjoy it on some level, I know I loved this when I was younger, and it’s not without some highlights. It can get a little imaginative, the creatures are still cool and it conveys some genuinely good words of wisdom at the end. Not a bad movie by any means, but certainly not a great one, good for nostalgic reasons, but not that re-watchable either. 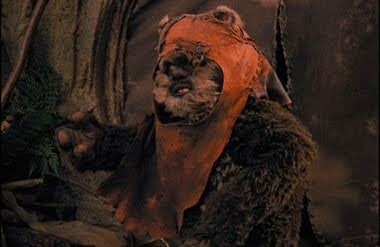 I give “Cavern of Courage: An Ewok Adventure” 3 stars out of 5. 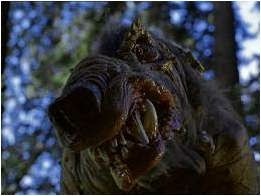 Stay Tuned because next I'll review the 1985 squeal titled "Ewoks: The Battle for Endor".